A kit from Aaeon is designed to be used with its Omni series. It builds on the series’ modular design and allows users and distributors to quickly convert panel PCs into digital displays and vice-versa. 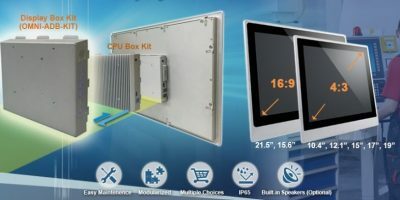 In addition to connecting Display Box kits to existing panel kits, customers can also buy complete OMNI Display units. The Omni display series includes panels in seven different sizes, ranging from 10.4 to 21.5-inch. They are all fitted with full HD LCDs and customers can choose between PCAP and resistive touchscreen models. The robust panels are finished with an IP65 aluminum front bezel and have a variety of power protections. They offer a 12 to 30V DC power input range, over-voltage protection, under-voltage protection and over-current protection and reverse power protection. Customers can also choose between terminal block and power jack connections. The panels operate in the -10 to +55 degree C temperature range. Acording to Aaeon, the display box kit only takes minutes to install, as just three screws are used to fasten the kit – and the alternative CPU box kit – to the display panel. The kit gives users access to both VGA and HDMI video interfaces, and a USB port enables connection to a PC, and built in speakers are available as an option. Established in 1992, Aaeon is a designer and manufacturer of professional intelligent IoT solutions, including industrial motherboards and systems, industrial displays, rugged tablets, embedded controllers, network appliances and related accessories, as well as integrated solutions. Aaeon also has the hardware and services for OEM/ODMs and system integrators worldwide. As an Associate Member of the Intel Internet of Things Solutions Alliance, Aaeon offers customised end-to-end services from initial product conceptualisation and board product development to mass manufacturing and after-sales service programs.